Amid nationwide truck driver shortage, shipper A. Duie Pyle opens new training program in Northborough, Mass. New Big Rig School for Mass. Across the U.S., the American Trucking Associations have estimated, more than 25,000 truck driver jobs are going begging because of a shortage of people interested in learning to drive big rigs -- and willing to endure at current industry salary rates the long hours, traffic, and time away from home. 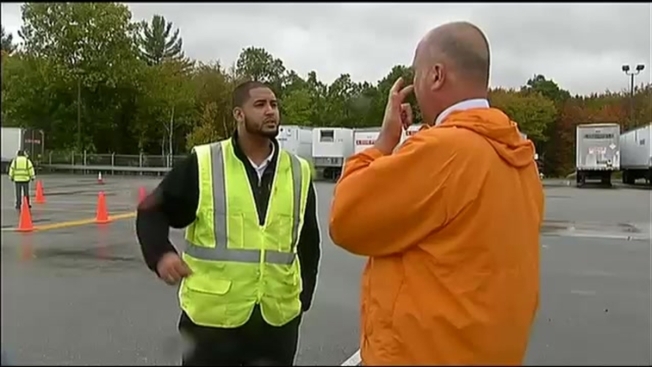 Here in New England, shipper A. Duie Pyle is taking aim at the problem -- by opening up the region's newest school for truck drivers, with its first 10 students now about a week away from graduating and getting jobs as local delivery and pickup drivers working out of terminals like the one on Bartlett Street in Northborough where the class is held. Pyle, based in West Chester, Pennsylvania, near Philadelphia, puts up the roughly $20,000 per person cost of training drivers and paying them while they are in class. "There's a national driver shortage. We're trying to find as many qualified drivers as we can, and we're finding we can't find them out in the marketplace, so we said: Let's make our own. Let's find people with the right attitude, right spirit, who want to work hard," Pyle executive Pete Dannecker said in an interview Wednesday. Drivers can expect to make good money after graduating the class. "We averaged, out of this facility, $71,000 over the last year is what drivers made here," Dannecker said. "It is hard work," typically requiring six-day workweeks of 55 to 60 hours. Ramon Cardona, a shipping dock worker for Pyle, was recruited by the company to join the driver school and says he has loved the quality and rigor of the instruction -- and the fun of being at the wheel of am 80,000-pound 18-wheel big rig. "You see them on the road all the time time, and you realize, they're big, but when you're there in that driver's seat, it's a whole lot different," said Cardona, who hopes to drive for a Pyle terminal in Carteret, N.J. "It's a lot to look out for. It's completely different from driving a car." Drivers are drilled on a five-point system of making sure they're constantly checking side mirrors and maintaining awareness of traffic nearby. "Safety, safety, safety" is a huge theme of the eight-week training, Dannecker said. "How to get in and out of the truck, how to drive the truck, how to protect their back if they're moving freight. It's so important." Lisa LaRiviere, who works out of the Northborough terminal, graduated from Pyle's original driving school in West Chester and now does pickup and delivery work six days a week along the New Hampshire seacoast. "You kind of expect to be in the classroom for a while, and then after two weeks, they're like, 'All right -- we're going to go out in the trucks today.' And you're just like: Already? It's pretty exciting. They get you right out there." And she said, while it's hard work, she loves being at the wheel of a tractor trailer: "You get your work assignment in the morning, and then it's all on you to get your work done. You're outside, you're not behind a desk, you're driving a truck -- it doesn't get any better."